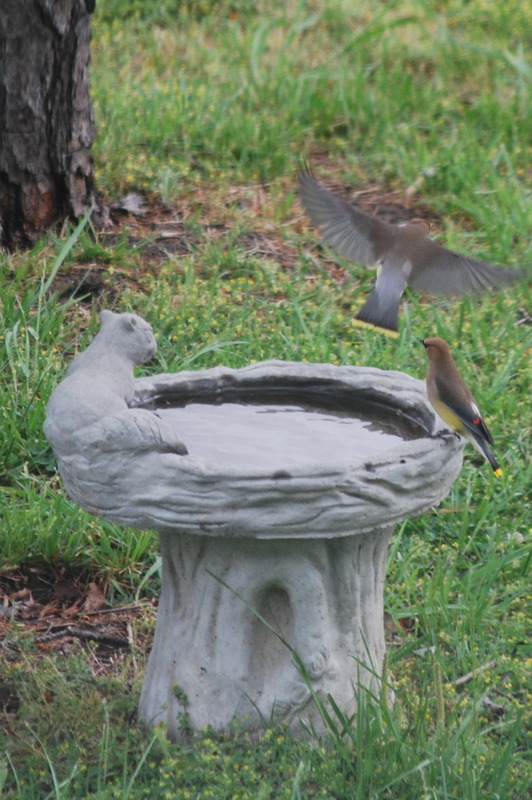 Anyway, while he was busy at the computer, something caught my eye out the window in the direction of the birdbath. At first glance, I knew it was a bird that I wasn’t accustomed to seeing. 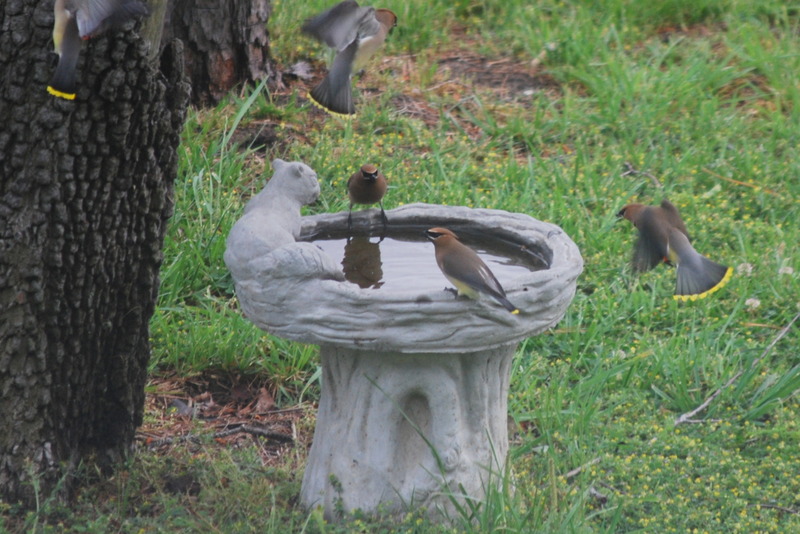 The birdbath was a flurry of activity, with yellow-tipped tailfeathers everywhere. We began looking in the Audubon Field Guide (which Marshall had thoughtfully given me a few years ago), and found Cedar Waxwings. Marshall is familiar with those, but the ones he has seen weren’t this colorful. These birds looked exactly like the pictures of a Bohemian Waxwing. There was just one tiny problem. According to Audubon: “Breeds from Alaska, Yukon, Mackenzie, Saskatchewan, and Manitoba south to central Washington, northern Idaho and northwestern Montana. Wanders irregularly farther south and east during winter. Also in Eurasia. Hmmm.. well, since we’re in Virginia, and it isn’t winter, this must not be a Bohemian Waxwing, unless they took a MAJOR wrong turn. So, apparently, we didn’t have a rare sighting of a Bohemian Waxwing, but we did enjoy the Waxwings that DID visit, and it’s nice to know my files are safely backed-up once again. Thanks, Marshall. 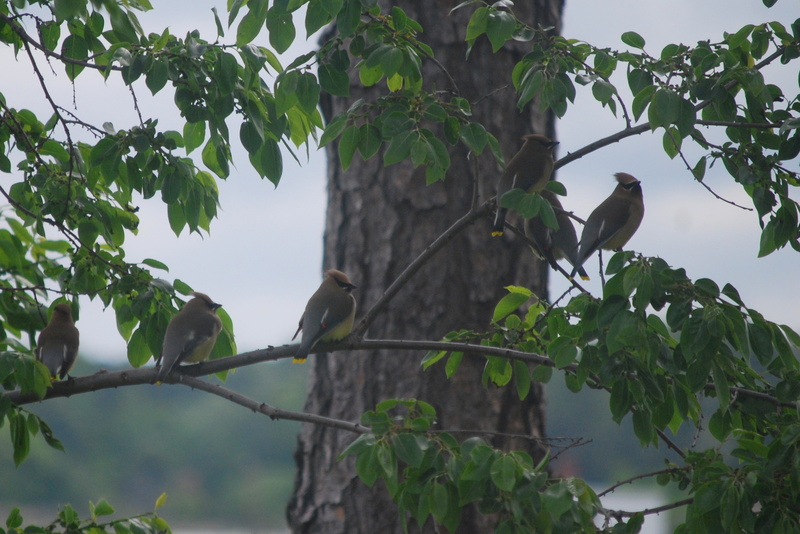 This entry was posted in Days at Home, Family and tagged bohemian waxwings, cedar waxwings. Bookmark the permalink. Way cool masks and coloring WHATEVER type of waxwings they were…..if they WERE Bohemians, perhaps their GPS devices were “off” or their radar wasn’t working and they ventured out of their regular range JUST TO COME SEE YOU! 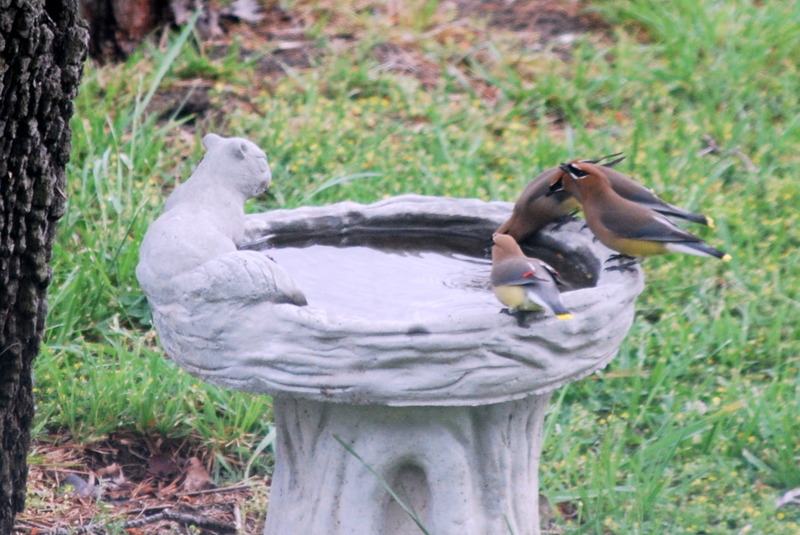 Great photo captures either way….always nice to see something new at the birdbath…. These birds are so beautiful! I just love the bright yellow-tipped tail feathers that look like fans when you captured them in flight:) The fact that there are so many of them at one time, does seem that they are group migrating. And just because there is a “typical” migrating pattern at certain times – with the crazy weather patterns this year – they could be Bohemian:) One year I saw a flock of eastern bluebirds in front yard that were obviously migrating and it was so amazing. God’s creation is so magnificent! Thanks for sharing a part of that with all of us! From what I just looked up, in Google images, it could be, it just could be one…the mask, the yellow tipped tail feathers point to it. The map I saw shows your area during their “non-breeding” season, but their breeding range is in Canada and the other places you mentioned. How nice that Marshall can back up your files “effortlessly so your files don’t get as “lost” as these lovely birds. Great pictures, especially the masked one. They are delightful! You really captured some really great shots. Being a fan of yellow (and the yellow/gray combo) these may be my new favorite birds! Great job catching the yellow on the flared tail feathers! i love when waxwings zip through. Waxwings are some of my favorites, too, but these just looked different. I did more research, and now that I see the pics, we definitely had *Cedar* Waxwings. There’s a feature the Bohemians don’t have.. : the white “tertials” – the innermost wing feathers that look like two white lines going partway up the back. Only the Cedars have those. So: these are Cedars! Maybe I had just never seen that many together that were so active ???? OH they are gorgeous — one of my fave birds, and we just don’t see them often here. Your pictures are GREAT! Birds of a feather, flocking together! Regardless of their species, they are adorable. That mask is so cute. lol The yellow of they tails is so bright and pretty. I think they’re all Cutie-pies. So charming! And they came together! I’d love to know what they were doing in Virginia. Lost or vacation? They must be visiting with groom swan. Your area is so lovely, word had to get out, even to the birds. I’m sure Marshall loves to help his mother. Aren’t sons special! We saw a flock of them once, filling the crepe myrtles and feasting on the berries. There were so many! I’m glad they came to visit your yard, what a treat! Super pretty birds. I hear tell we have those here in Northern Idaho but I don’t think I’ve ever noticed those before, I’ll be paying more attention now. I think not only are their masks cool I really like that band of yellow on their tail feathers. They certainly are pretty wee birds – I love the yellow tips of the wings. You got some really good pictures of them too. Sometimes birds surprise us in their ranges. Maybe because it was snowy in the NE during their visit, they decided to make a quick trip down to Va. 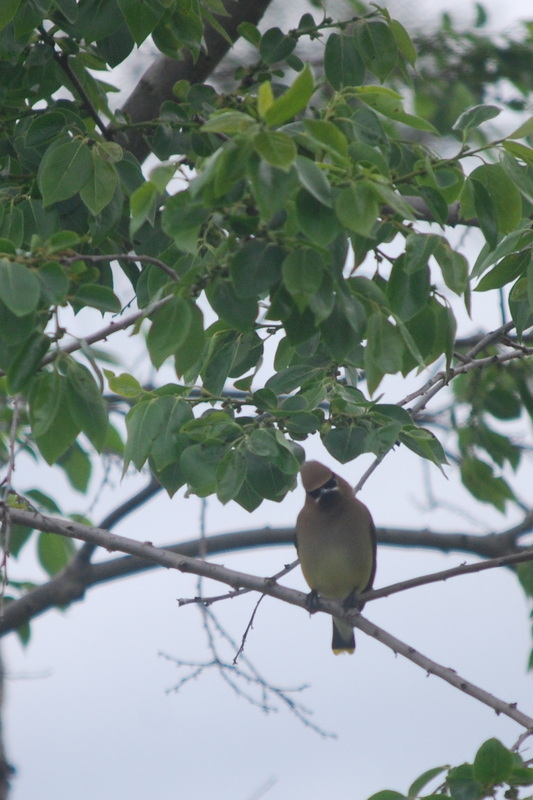 I have never seen a cedar waxwing with a yellow tipped tail! These birds are just beautiful, whether Bohemian or regular waxwings! Maybe a serious birder can help us out!